Summer opens up a whole new host of possibilities in Greenland, from kayaking among glaciers under the midnight sun to fishing in empty fjords. The summer is short, but intense, and the flora immerses the landscape in a burst of seasonal colour, with picturesque hiking trails and sailing some of the many highlights. 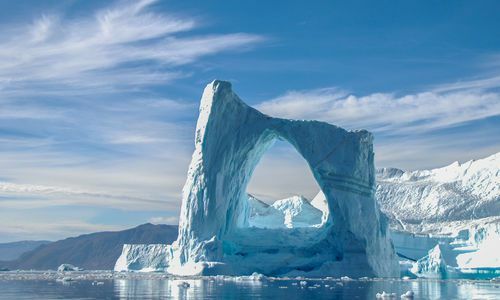 Greenland is synonymous with icebergs, and upon landing in the country you don’t need to look far to come across one, calving into the roaring sea. One of the best places in which to experience this magnificent act of nature is Ilulissat. Peppered with icebergs and glaciers in its fjords with their colossal calving siblings just in the distance, it's best witnessed with a sailboat, spotting whales and seals. There's even kayaking to really get up close, or walk the old settlement on the icefjord to witness the huge house-sized pieces of ice break off into the water, before a magical nighttime cruise under the midnight sun. Helicopter rides are also wonderful way of witnessing the intensely scenic landscape; a myriad of fjords snaking among icy blue glaciers, linking the colourful towns of Qaqortoq and Narsarsuaq. 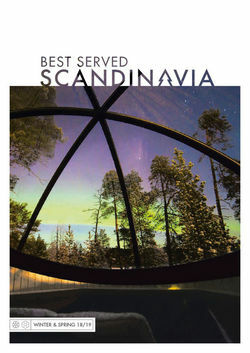 Here, discover lost Viking ruins, thermal hot springs and grandiose glaciers that creak off mighty icebergs. Narsarsuaq’s colourful sub-Arctic flora named 'Flower Valley' is a spectacular way to reach the mighty ice cap, the second largest in the world, and its melting glaciers afford opportunities for an up-close kayak. 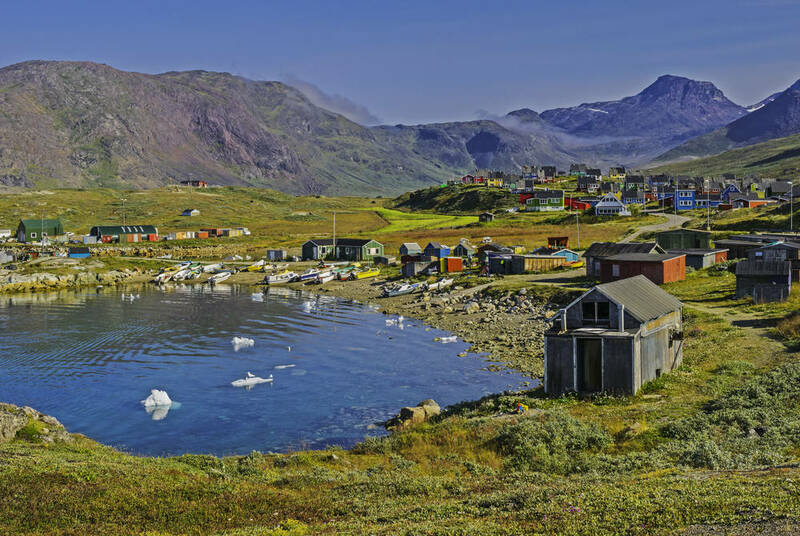 Neighbouring Qaqortoq’s got rolling banks, snow-capped mountains and hilly streets, where sheep farms and colourful houses set the scene for dramatic icebergs floating among breaching whales. Greenland is home to a number of Norse settlements that can be explored year-round, but there’s something special about strolling among the verdant rolling hills, with colourful houses perched atop, in the eternal midnight sun. The settlement of Narsarsuaq is true Greenlandic charm at its best with red-housed villages and winding lanes, or neighbouring Qaqortoq offers boat trips to archeological site Igaliku for fascinating exploration of ancient Norse ruins. Nearby lie the Hvalsey Church remains, Greenland’s best-preserved example of Old Norse settlements. 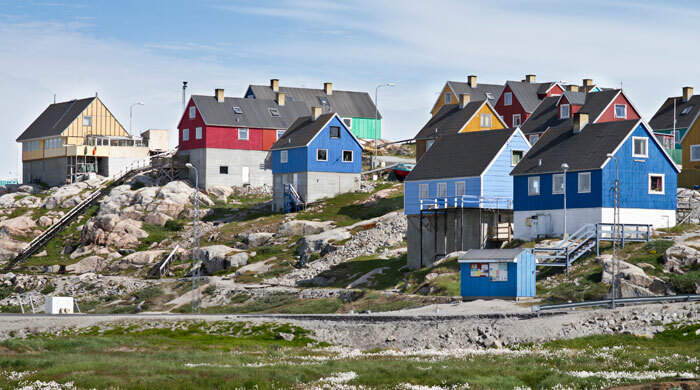 Ilulissat is also a wonderful backdrop for the 4,000-year-old settlement of Sermermiut, where icebergs float past as visitors learn about Inuit life and traditions. And summer also allows for fantastically fresh produce, including casseroles made with Greenland halibut, and apples and Greenlandic berries. 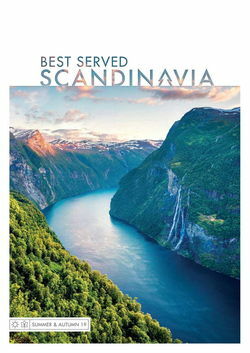 Unsurprisingly, the country's crowning glory is seafood – don't miss a sample in charming seafront cafes served up to spectacular fjord views.